Design Registers | View by object | Ceramic shapes | Tableware | Earthenware & Porcelain Dinner Service. You are here: Home > Exhibitions > Design Registers > View by object > Ceramic shapes > Tableware > Earthenware & Porcelain Dinner Service. 181722 - T C Brown, Westhead, Moore & Co - 24 November 1864 - Earthenware & Porcelain Dinner Service. Subject of design: Earthenware & Porcelain Dinner Service. Class No 4. Design for Earthenware and Porcelain Dinner Service. Messrs. T C Brown Westhead Moore & Co, Cauldon Place, Staffordshire Potteries. 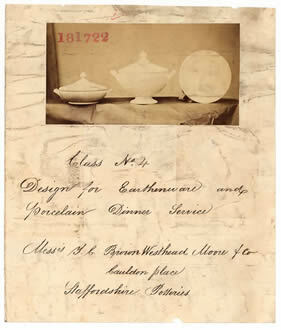 Dinner services were, and remain, one of the staple products of the ceramics industry in Great Britain for both domestic and export markets. BT43/68 contains many representations for designs for dinnerwares. The most distinctive shapes were the tureens [dishes with covers]. Many of the registrations are solely for these, plates and other flatware being of standard shape.